The Hamas Movement has affirmed that the first Intifada (uprising) in 1987 has represented an important station for the Palestinian resistance in modern history and reflected the national unity practically on the ground. In a statement released on the 31st anniversary of the first Intifada, Hamas said that the Intifada was a popular uprising characterized by the unity and strength of the social fabric. 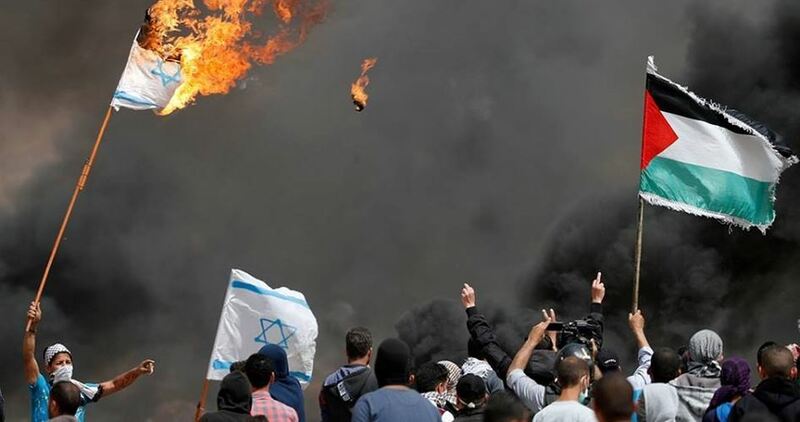 “The Intifada has exposed the ugliness of the occupation and encircled it everywhere,” the Movement said, adding that the reasons that led to the eruption of the first Intifada are still present. 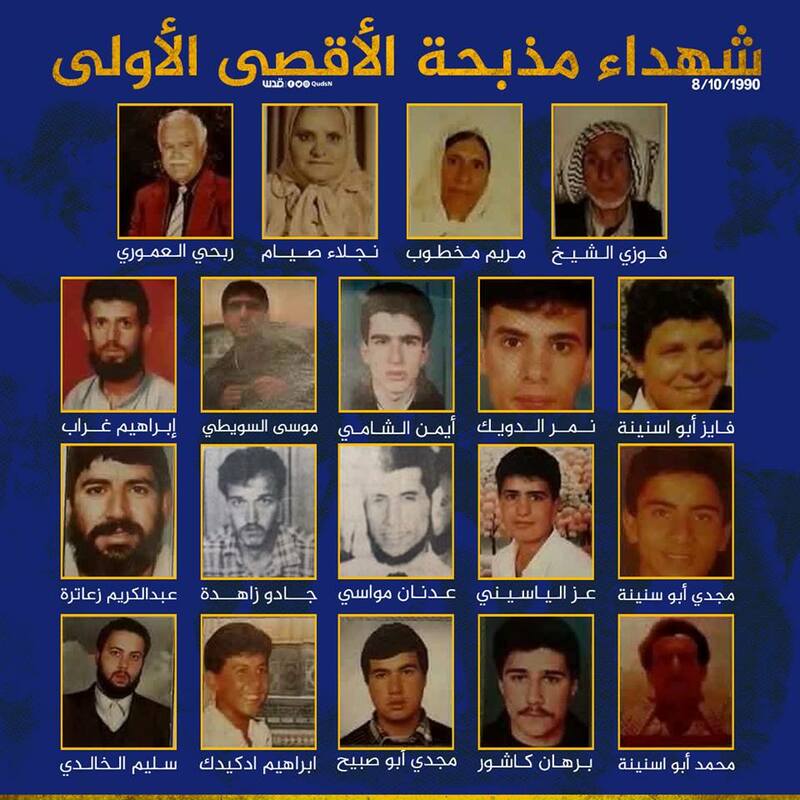 At the courtyards of Al-Aqsa Mosque, and at noon on Monday, October 8, 1990, the Palestinian blood was heavily spilled, when the sound of bullets surpassed all other sounds, when the Israeli occupation forces carried out one of the most horrific massacres throughout its black history. This massacre resulted in the killing of 22 Palestinians and the injury of 200, as Israeli occupation soldiers brutally opened fire at worshipers and innocent civilians at the courtyards of Al-Aqsa Mosque. The terrible massacre was met with widespread condemnation, in which observers declared that the Israeli forces violated all taboos, and that their massacre exceeded all red lines. On Monday, October 8, 1990, just before the noon prayers, the settlers of the so-called ‘Temple Mount Trustees’ tried to lay the foundation stone for the alleged Third Temple at Al-Aqsa Mosque. Thousands of Palestinian worshipers stood up to prevent them. It was on this moment that Israeli forces opened fire indiscriminately, killing 22 Palestinians and wounding more than 200, before arresting 270 others. The occupation forces then hindered the movement of ambulances. The Israeli occupation was not content with the occupation of the Mosque in 1967, nor to burning large parts of the Marwani chapel, the main prayer site at Al-Aqsa Mosque in 1969, nor to attacking the worshipers at Al-Aqsa in 1982, nor was it satisfied with the excavations and tunnels that undermined the foundations of the Mosque, trying to penetrate it many times in 1986/1987. Organizations and groups supported by official Israeli institutions began drawing up plans, clearly declaring that they were preparing to build the alleged Third Temple at the expense of Al-Aqsa Mosque. Calls for performing Jewish prayers there were steadily increasing. Laying the foundation stone for the construction of the Third Temple inside Al-Aqsa Mosque was the first step to build the alleged temple. Gershon Salomon and his group, ‘the Temple Mount Trustees’ announced that they will lay the foundation stone of the Third Temple at Al-Aqsa Mosque, in conjunction with the Jewish Feast of Tabernacles, on Monday October 8, 1990. The atmosphere was intense, and Jerusalemites sensed the danger, and gathered before the declared date to protect Al-Aqsa Mosque, as worshipers gathered inside the Mosque since the early hours of the morning. On the eve of the Jewish Feast of Tabernacles, the Israeli forces had prepared a plan to confront worshipers at Al-Aqsa Mosque and took a decision to attack Al-Aqsa Mosque and everyone there on Monday morning. Half an hour before the massacre, the Israeli occupation forces erected military checkpoints on all roads leading to Al-Aqsa Mosque to prevent worshipers from reaching the holy site. However, worshipers gathered at the Mosque hours before, in response to calls made from inside the Mosque. The firing of live bullets and toxic bombs, tear gas and rubber bullets, was carried out against worshipers without discrimination between children, women and elderly. 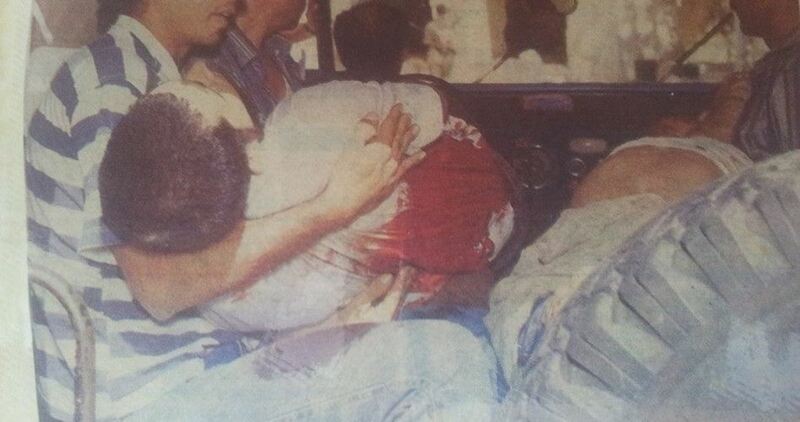 This led to the killing of 22 Palestinians, and the injury of more than 200. The Israeli forces attacked the wounded and detainees at the Dome of the Rock, and the Marwani Mosque, forcing the detainees on the ground, tying their hands, and treating them with humiliation. It was a spontaneous gathering and a natural response to the Israeli occupation plans. The masses were mostly from Jerusalem, but also from the West Bank and the Palestinian Territories Occupied in 1948. The martyrs were from Jerusalem, the Palestinian Territories Occupied in 1948 and the West Bank, which showed that the Palestinian blood unified Palestinians and their stands, together protesting out loud against the oppressor in defense of Al-Aqsa Mosque. The Israeli occupation soldiers remained in the courtyards of the Mosque and prevented the evacuation of bodies of martyrs and the wounded. The soldiers allowed the evacuation of the bodies and the wounded six hours after the massacre began. Today marks the 28th anniversary of the massacre of the first Al Aqsa Mosque, which was carried out by Israeli occupation forces. On Monday, October 8, 1990, before noon prayers, the settlers of the so-called “Temple Mount and Eretz Yisrael Faithful Movement” tried to lay the foundation stone for the alleged Third Temple in the Al-Aqsa Mosque. Israeli occupation forces opened fire indiscriminately at worshipers in the mosque, killing 22 people, injuring more than 200, arresting 270 others while obstructing the movement of ambulances. Prior to the massacre, Israeli forces imposed military checkpoints on all roads leading to Al-Aqsa Mosque, to prevent them from reaching the site. However, the worshipers gathered in the mosque hours earlier, in response to calls from inside the mosque. Israeli occupation soldiers remained in the squares and prevented the evacuation of the bodies of the martyrs and the wounded, only six hours after the massacre began. According to the PNN, the Jews closed the Mughrabi Gate after the massacre, claiming that the entry of Muslims was a threat to their lives. September 30, 2018, marks the 18th anniversary of the murder of the Palestinian child Mohammed al-Durrah by Israeli soldiers in a scene that sparked international furor. The footage shows the pair hiding behind a concrete cylinder, the boy crying and the father waving while trying to protect his son. The father was first shot in his right arm before he caught sight of bullets penetrating his son's back. Sharon toured al-Aqsa Mosque's courtyards and announced the site an Israeli-controlled area, which led to the outbreak of violent clashes between Palestinian worshipers and Israeli soldiers. 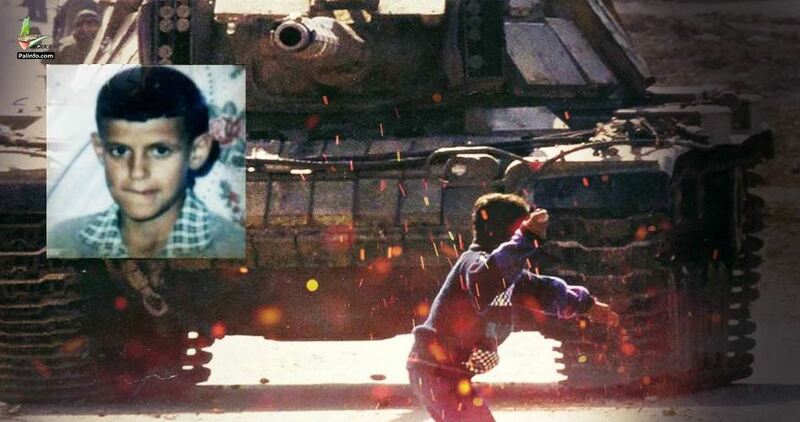 These days coincide with the anniversary of the outbreak of Al-Aqsa Intifada in 2000, which marked a turning point in the Palestinian cause, changing many equations. Due to its revolutionary action, the Israeli occupation withdrew from Gaza; initiating a new phase for the liberation of Palestine.